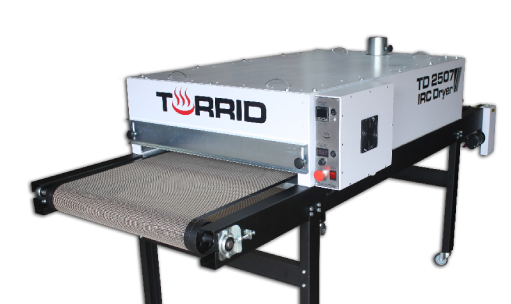 In addition to the Torrid flash dryer range, NSDS offers state of the art conveyer ovens for every level of print shop. 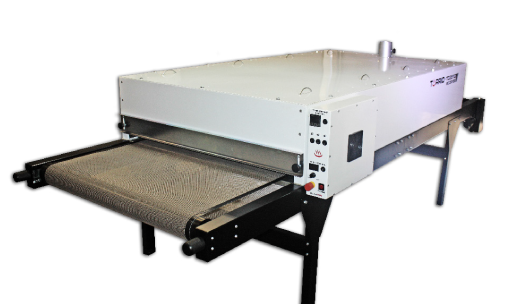 From a table top unit at only 170cm X 60cm, right up to mass production industrial units of up to 450cm X 120cm. All units are designed to be ultra energy efficient, making use of ceramic IR elements as used for paint curing in the motor trade. This allows us to deliver extremely constant heat with the minimal use of electricity, complimented by a perfectly insulated chamber. Water based and plastisol inks can be cured in all our units, and you will have peace of mind that the job is done correctly time after time. The 2507 features a belt length of 250cm with a width of 70cm. This unit is capable of good levels of production, and would suit mid size to larger shops. The 3510 features a belt length of 350cm with a width of 100cm. 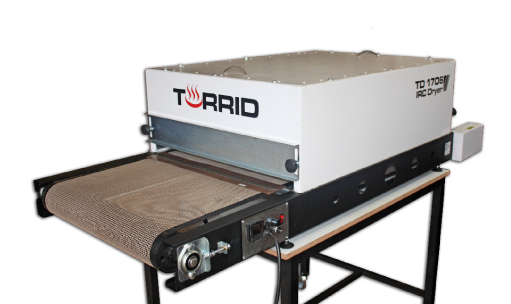 This oven is capable of serious production, and would suit large print companies using automatic carousel equipment. A good optional extra would be active air control, allowing air movement to compliment the already excellent curing capabilities. Active Air comes standard on all ovens 4,5 meters and up.